When treating a child suffering from sudden cardiac arrest you need the right equipment! 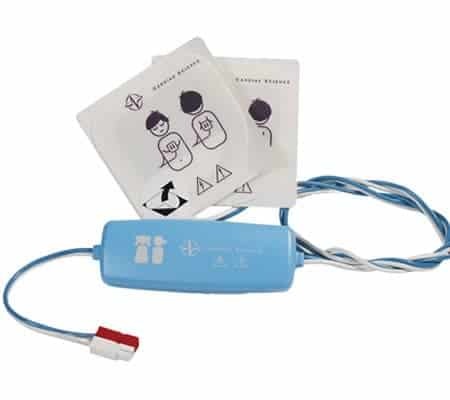 Whether as a spare set in your first aid kit or pre-connected to your defibrillator, you need Paediatric Defibrillation Electrodes. For treatment of children between the ages of 1-8, when connected to your device the Paediatric Defibrillation Electrodes reduce the energy output from the defibrillator, making the unit suitable for use on children’s hearts. These pads are designed for efficiency, they can be placed on the victim in any order and have easy to open foil packaging to protect the pads until they are needed. The inexperienced can be confident when using a defibrillator on a child with clear directions on the pads as to where to place the electrodes. 40% of sudden cardiac arrest deaths in people from 1-35 years of age go unexplained. Whilst not as common as events in older people, this unexpected killer still claims the lives of 2-3 young Australians every week. The youngest and more vulnerable of this under 35 group requires adjusted treatment for sudden cardiac arrest. Children between 1 and 8 years of age require specialised pads to be used with defibrillator intervention that reduce the amount of joules that the defibrillator provides to make the level of electrical current acceptable for a young heart. With speed being essential to treatment of anyone who has suffered a cardiac arrest, Cardiac Science has developed Paediatric Defibrillation Electrodes that are easy to use and quick to set up. You can either have the pads pre-connected to the machine or kept with your defibrillator for use when needed. They are easy to remove from their foil packaging and have easy to peel plastic covering on the sticky adhesive. There has recently been research conducted into the causes of nearly 500 sudden cardiac arrest deaths over a period of 3 years between the Australian and New Zealand population. These deaths were all of people under the age of 35 and went unexplained. Through reviewing autopsies, coronial and police reports most of these deaths were explained by heart disease (24%), inherited cardiomyopathies (16%), myocarditis (7%) and aortic dissection (4%). But 40% went unexplained until further investigation was conducted, investigation that would not normally be carried out. Testing found that 27% of the deaths could be traced back to relevant genetic mutation, despite evidence that all the victims had structurally normal hearts. The remaining 13% are as yet unexplained. With this in mind, it is important to understand what causes sudden cardiac arrest and how to treat such an event, as clearly adequate warning or prior awareness of the possibility of an incident in children is quite unlikely. Sudden cardiac arrest is caused by the electrical system that controls the heartbeat failing to provide the correct electrical impulses to the heart. This causes the heart to beat too fast, too slow or irregularly, with the resulting beat being termed as an arrhythmia. When the heart does not beat properly or fails to beat at all the blood within the body cannot flow to all the vital organs and provide the oxygen they need to survive. There is also no ‘washing out’ of the poison that is naturally created by the metabolism in the body’s cells. The body cannot survive for long without oxygen, which is why defibrillation is so important in treating a victim of a sudden cardiac arrest. A defibrillator provides electrical pulses to the heart in order to jolt the heart back into regular rhythm. These units have the power to provide the highest amount of joules needed to start any heart, but therefore, they must be adapted for use on the small, delicate hearts of children. Paediatric Defibrillation Electrodes have been designed for this purpose, so that a child suffering from a sudden cardiac arrest can be appropriately treated, and so that more lives are not lost to this deadly killer.